CLMHD 2018 Youth Mental Health First Aid (YMHFA) Instructor Certification Program - Now Accepting Applications! As part of our efforts to reduce the stigma of mental illness and expand the number of people trained to teach Youth Mental Health First Aid, the Conference is once again providing scholarships for to up to 30 individuals throughout the state to participate in a 5-day YMHFA Instructor Certification program. October 22, 2018 in Albany, NY. CLMHD will cover the cost of the training, materials, travel, meals and lodging for attendees. A "blended training" will once again be offered for up to four individuals who are already certified as Adult MHFA instructors - these participants will only be required to attend the first 2.5 days of the training. If you or someone you know is interested in applying, click here for the application.The deadline for submission is August 24, 2018. Completed applications are to be signed by your county's Director of Community Services (DCS) for approval, then forwarded to CLMHD for review by a YMHFA Advisory Committee. Individuals will be notified of their selection by September 28, 2018 and must commit to the requirements established by the committee. For more information, please contact Francine Sinkoff at CLMHD at fs@clmhd.org or 518-462-9422. The New York State Office of Mental Health (OMH) today announced the availability of up to $75,000 in grant funding for projects that help reduce the stigma often associated with mental illness. This funding represents the revenues received through a voluntary tax check-off program launched in 2016. This program allows taxpayers to contribute easily to the 'Mental Illness Anti-Stigma Fund' when filing their NYS taxes. The Office of Mental Health will provide 15 grants of up to $5,000 each to support year-long stigma-reduction projects. Agencies must have at least one year of experience serving individuals with mental illness in order to qualify. Read more here. for 17 County jails throughout New York State in order to fund substance use disorder treatment and transition services. Kelly A. Hansen, CLMHD Executive Director, stated, "The County Mental Health Commissioners knew that providing addiction treatment during incarceration could reduce recidivism, save taxpayer dollars and most importantly, save lives. That is why the Conference of Local Mental Hygiene Directors commissioned the study which provides the data that confirmed our assumptions and quantified the benefits of jail-based SUD services. The Conference is grateful for the support from the Senate and Executive, as counties will be able to develop or expand SUD treatment and transition services prior to re-entry. This funding will not only help to reduce recidivism and improve public safety - most importantly, it will allow individuals struggling with addiction find lasting recovery." The Task Force advocated and secured $3.75 million in the 2018-19 state budget to help implement, support and expand these vital services in County jails throughout the state. For more information and to view a list of awardees, click here. The Conference is pleased to announce the new chair of the Children & Families Committee, Michael Orth, MSW, Commissioner for the Westchester County Department of Community Mental Health. Michael has worked in the human services sector for 30 years and joined the Westchester County Department of Community Mental Health (DCMH) in 1993. He was appointed Commissioner in January 2018 after serving as Acting-Commissioner from August 2017-December 2017, Deputy Commissioner from February 2015-August 2017 and 2nd Deputy Commissioner from 2009-2015. Michael graduated from the Iona College BSW program and the MSW program at Fordham's Graduate School of Social Service. county lead for Westchester's NYS System of Care SAMHSA Grant. We are pleased that Michael has accepted this appointment, as he will contribute a great deal to the Children & Families Committee and its work to address the major issues affecting children and youth in need of mental hygiene services in New York. Welcome, Michael! The NYS Department of Health this week announced that through the Medicaid Accelerated eXchange or ("MAX") Series, avoidable hospital use for the state's most vulnerable patients has been significantly reduced. Since its launch in 2015, the MAX Series has been an integral part of the Department's strategy toward successfully achieving Delivery System Reform Incentive Payment (DSRIP) goals. The objective of the MAX Series is to empower hospital and community partners in their care redesign efforts, increase patient and workforce satisfaction and reduce avoidable hospitalizations. More than 900 professionals from 68 hospitals and 11 community-based practices from around the State have participated in the MAX series to date, and early results among teams are showing an 18% reduction in hospital readmissions and an 8% reduction in hospitalizations overall. Read more here. SAMHSA is now accepting applications for $930 million in State Opioid Response Grants as it continues its efforts to address the opioid crisis. 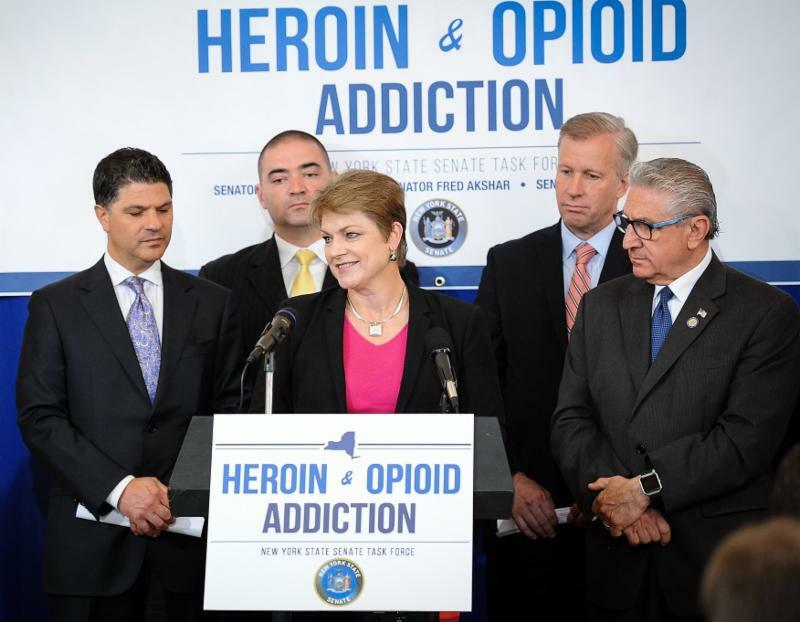 This funding aims to address the opioid crisis by increasing access to evidence-based, medication-assisted treatment; reducing unmet treatment need; and reducing opioid-related overdose deaths. SAMHSA is now accepting applications for $930 million in State Opioid Response Grants as it continues its efforts to address the opioid crisis. This funding aims to address the opioid crisis by increasing access to evidence-based, medication-assisted treatment; reducing unmet treatment need; and reducing opioid-related overdose deaths. Read more here. Payment and delivery system reforms are critical to achieve the Triple Aim of improved health, improved patient experience and quality, and reduced cost. While involvement in payment reform grows, participation remains challenging for many community-based behavioral health and long-term services and supports (LTSS) providers. This new CHCS brief examines the competencies necessary for community-based behavioral health and LTSS providers to successfully participate in alternative payment models, discusses the barriers they face, and explores how states, the federal government, and private organizations can increase community-based providers' readiness to participate in payment reform activities. In the days and weeks following the suicides of celebrity chef Anthony Bourdain and handbag designer Kate Spade, a chorus of social media users urged people with depression to not be "afraid" to ask for help. But for most Americans, fear isn't the thing that stands in the way of therapy. It's having no one to turn to. This was the case for Sue, 57, who spent over 30 years trying to get effective treatment for bipolar disorder, depression, anxiety and a personality disorder. For years, whenever Sue felt a major anxiety attack coming on, she'd panic. She would grab her keys, bolt out the door and frantically search for help. In rural Nebraska, that often meant walking up to two miles to the nearest neighbor's house or emergency room, sometimes in the middle of the night. Read more here. Pew Charitable Trust: Many Recommend Teaching Mental Health in Schools. Now Two States Will Require It. Amid sharply rising rates of teen suicide and adolescent mental illness, two states have enacted laws that for the first time require public schools to include mental health education in their basic curriculum. Nationwide, cities and states have been adopting a variety of initiatives over the past decade to address the rising need for mental health care in schools. Read more here. More than 115 Americans die every day of opioid overdose. Many more survive thanks to the antidote medication, naloxone. But a study out Monday finds that just 3 in 10 patients revived by an EMT or in an emergency room received the follow-up medication known to avoid another life-threatening event. The study, published in the Annals of Internal Medicine, followed 17,568 patients who overdosed on opioids between 2012 and 2014 in Massachusetts. It looked at survival rates over time and whether patients received medicines that treat addiction. Of the patients who did receive medication, 3,022 adults were on buprenorphine, known by the brand name Suboxone, and 2,040 patients were on methadone. The Suboxone group had a 40% lower death rate after one year, as compared to those who did not receive any medication. The results for methadone were even stronger: a 60% lower death rate. Read more here.